Superyacht tender builder V-Type has delivered the first of its new HYST chase tenders. Based on V-Type's wide-body tender hull form, the new chase tender is available from 9.5m to 15m. The first tender from this line is HYST chase tender 9.5m, which is completely custom boat based on V-Type's original hull design with interior customised to suit. The superyacht tender has been delivered to a successful charter yacht in Monaco, the 30m Benetti Tradition superyacht Jazz of Monaco.
' charters heavily,' says David Farmer, owner of V-Type. 'So the 9.5m HYST chase tender had to be able to get people around quickly and efficiently.' He notes that the new tender can carry up to 16 passengers. At light load, she is specified to reach a top speed of 50 knots. The HYST 9.5m chase tender features a deep-V hull and is designed to be tough, its prowess matching its aggressive, sporty styling. The first HYST 9.5m chase tender proved its mettle as it was delivered on its own bottom during a seven-day, 850-mile trip from Malta to Monte-Carlo, Monaco. 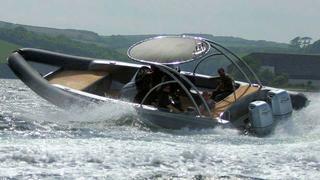 V-Type recently delivered a new 6.5m V-Type tender, the Vader 650C, to the 46.6m Akhir superyacht Project 12.